It's been five weeks since I began the "trucker quest." Thanks to whoever commented last week and reminded us of the great Socratic truth, "He is wisest who knows that he knows nothing." Unfortunately, this week at orientation was more like a lesson in Darwinian philosophy; "Survival of the fittest." Our trainer at orientation sent one of seven students home when she couldn't cut it on the road. This made me realize just how serious this company really is. 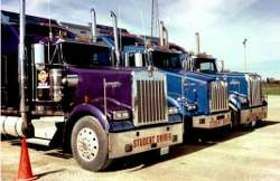 After we were invited to orientation as student drivers, we were sent to a trucking school to fine-tune our skills and to be evaluated. One girl was cut on Friday after stalling out on a 2% upgrade. She couldn't get the truck started up again after popping the clutch too fast, stalling and stalling, seven or eight times on a dark road in the early hours. With another car in the rear, this girl was drifting precariously back, and brought us all closer to a very frightening moment. It could have been a serious accident. The next morning, the trainer pulled her out of class. He told her she was going home and, although he was sorry, he just didn't think she was safe. This trainer was a real character. He was an old war hero who had fought all over Southeast Asia in the 1960's and 70's. He reminded me of the "Brahman Bull," powerful but calm. He didn't need to yell at you in order to scare the crap out of you. He also didn't mess around when it came to safety and truck driving. Right away, I told him, "This might take me a while to get it." I was scared after he got all over another kid from our class. Then, when I started shifting, he said; "What kind of crap are you trying to sell me man? You look like you got something in your family that makes you a real natural." I was so glad to hear those words. The girl in our class wasn't so lucky. The trainer had tried to be patient with this girl but she had actually scared the crap out of him that morning. He told her she could come back in 6 months but she said "I'm not coming back here." She was bitter and she left in a few short hours. "I hated having to cut her." He told us later, "I stayed up all night thinking about it." Then he finished off by telling us "The bottom line is, she just wasn't safe." He had to put her on the bus that morning and the rest of us went on to practice on the skid pad that afternoon. Did someone say "skid pad?" Yes, you heard it right folks. One of the biggest perks of getting hired by this company was practicing on the infamous "skid pad." We were told to throw the rig into a near-jackknife and recover from the skid before it was too late. It was great practice. Several people had already claimed that this pad saved their life when they were out on the road. Although the girl in our class never got the chance, the Brahman Bull looked favorably on the rest of us. We got to have some real fun that day and the 19-year old kid in me really got loose. I learned, even if you can't see it in your mirrors, you can FEEL yourself going into a skid. You start to float and you will know it when it happens. The natural instinct is to get off that brake and pull out of the skid. Orientation was pretty stressful but also very fun. Tomorrow we officially sign on with the company and meet our trainers for a 7,500 mile finishing phase. Then it's back to the main terminal for our first truck assignment and first solo run. As the great Socrates once said, "He is wisest who knows that he knows nothing" and I am proud to say that I have no idea what's going to come next. I can say, however, that I am glad I have the chance to see it all first-hand. See you out on the road!